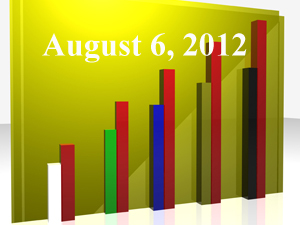 “Experts Advise 401k Plan Sponsors on 408(b)(2) Fee Disclosure Template,” (FiduciaryNews.com, July 31, 2012). Did the DOL miss the boat by not offering a definitive “apples-to-apples” comparison template? If there’s no pain, there’s no gain. So when the DOL takes a step backward because entrenched industry interests might feel some pain, where does that leave our gain? Worse, the DOL’s decision doesn’t even address the real problem and has left a large chunk of plan sponsors in limbo. Oh, and let’s not even start on what’s going on in the Senate (other than to thank our lucky stars for gridlock). “DOL does turnaround, backs off controversial brokerage window provisions,” (InvestmentNews, July 30, 2012) This really is a bad precedent. If the DOL turns tail every time a fiduciary ruling exposes someone to their true fiduciary liability, who’s left to protect the beneficiaries? “U.S. clarifies fee disclosure rules on 401k retirement plans,” (Reuters, July 30, 2012) Wait! There’s more to the story. It turns out the DOL only backed off in cases where the plan has a designated investment alternative. In many small to mid-sized plans, and especially in professional groups, the entire plan is often in self-directed options. “A modest proposal on retirement,” (BenefitsPro, July 31, 2012) A tongue-in-cheek perspective on Senator Tom Harkin’s lark of a proposal. If we needed any proof regarding the uselessness of disclaimers, this is it. “Overestimate of Pension Benefit Not a Fiduciary Breach,” (PLANSPONSOR.COM, August 3, 2012) This is all about the important of disclaimers. The plaintiff relied on erroneous data provided by the plan’s administrator, who was not acting as a fiduciary. The court ruled it was unreasonable for the plaintiff to rely on such data, given the disclaimers. We’ve got two constituencies benefiting from fee disclosure. On one hand, there’s the plan sponsors, who’ve actually be granted a lot more power than anyone is telling them. Service providers won’t like this. On the other hand, there’s the plan participants, who are about to find out if and exactly how they’re getting screwed. Both plan sponsors and service providers won’t like this. “Revenue Sharing Fee Analysis Now Available at Participant Level,” (PLANSPONSOR.com, July 31, 2012) Here’s a sneak-peak at what Fred Reish thinks on the subject of revenue-sharing: Watch out! Especially if half the plan’s assets are held in low-cost index funds or company stock. That means the other half is paying for the lion’s share of fund expenses. Not fair. Not fair at all. And the plan sponsor should know that. “Time for 401k sponsors to take a stand,” (BenefitsPro, August 2, 2012) Here’s a good take on the new fee disclosure rule that every plan sponsor should read. Despite all the complaints, there’s a reason why many mutual fund portfolio managers are in their 30’s: They have something to prove and that’s what drives them to success. Likewise, there must be a reason why so many 20-year olds still live with their parents (other than that their parents want them to), which, when it comes to investing, leads us to only one obvious conclusion: never trust anyone under 30. “Gen Y Most Properly Allocated 401k Participants,” (PLANSPONSOR.com, August 2, 2012) First, this “conclusion” is based on the fact this youngest cohort of employees has the highest percentage of their 401k plan assets in target date funds. Second, this assumes the target date funds they’re invested in have the appropriate asset allocation. Truth be told, this is the easiest group to measure in terms of “appropriate” asset allocation since almost everyone agrees they should be fully invested in equities. Now, if those target date funds include any impurities (let’s call the “bonds), then this conclusion is erroneous. Better conclusions might be “Gen Y is the laziest group of 401k participants” or “Gen Y 401k investors most likely to succumb to investment fads.” Maybe it’s just simpler to say, when it comes to 401k investors, young people are naïve. The Chicago Financial Planner: Financial Prognosticators or Product Sellers? Great stuff Christopher. I liked the lead article about disclosure. I was really hoping this would be a big step forward for consumers, but it’s looking less and less so.